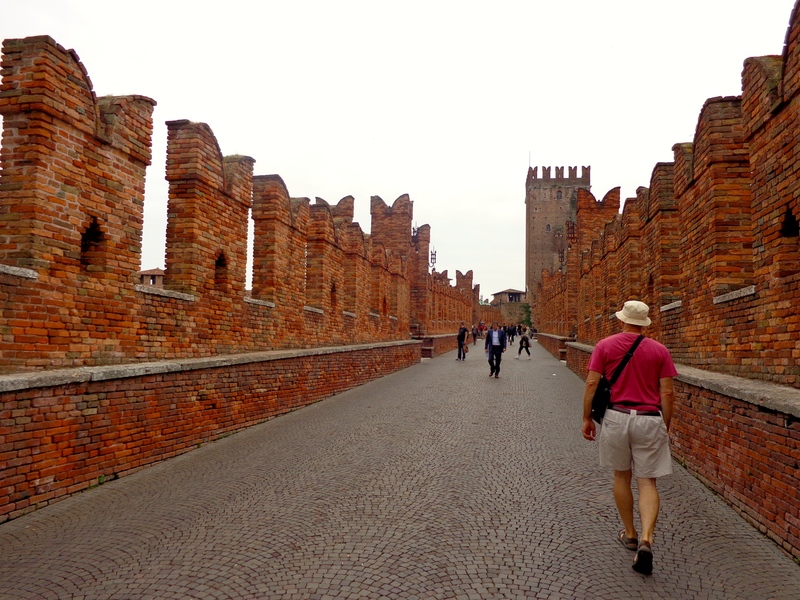 Verona’s ‘Faire Old Castle’ ~ Lords of Foul Play? 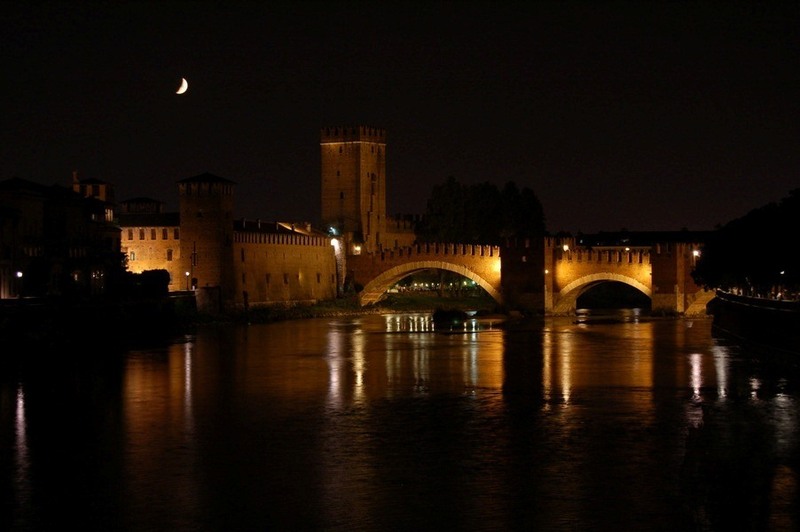 Mystery surrounds Lord Cangrande I (1291 to 1329), early Lord of Verona, like a dark shadow. Historical documents claimed he expired suddenly from polluted drinking water but doubt remained among scholars. Shocking results from a recent exhumation revealed toxic levels of digitalis, a strong poison from the Foxglove family, discovered throughout his liver and colon. It appears that he was likely poisoned under the cloak of medical treatment in the midst of his astounding military victories. One of his physicians was hung afterwards by his successor, Mastino II. Foul play? One would think so. Lord Cangrande I was the most celebrated of the Scaliger family, the Lords of Verona, who ruled from 1260 to 1387. A noble ruler who was a warrior, prince and patron of Giotto, Dante and Petrarch, he didn’t live to set foot inside Castelvecchio. Lord Cangrande II della Scala had the castle and bridge built in 1355 for his protection and that of his ruling family. With a reputation opposite that of his predecessor, he was a cruel and tyrannical governor who needed a safe escape route from his abundance of enemies. Venice, the Sforza family and the Gonzaga were a constant threat. 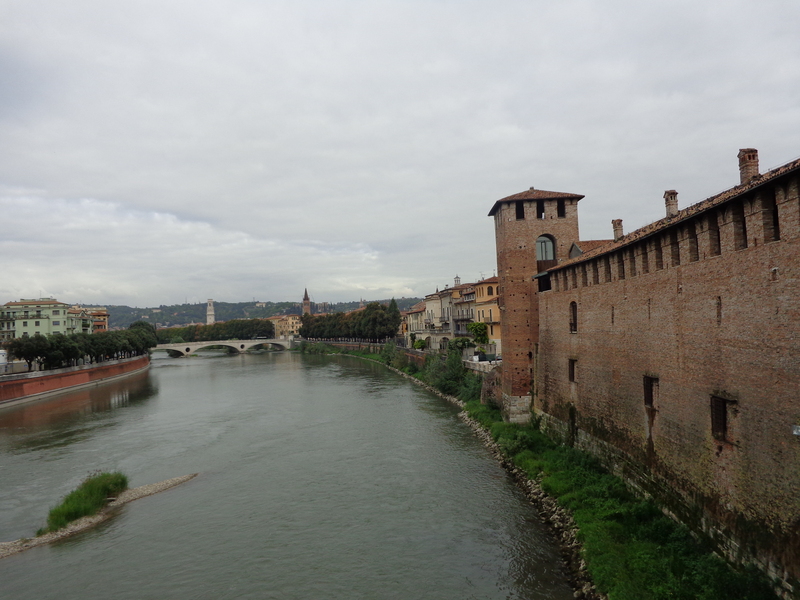 He had no lack of forceful neighbors who surrounded his keep in Verona. If needed, the bridge would allow him to escape northwards to relatives in Tyrol. 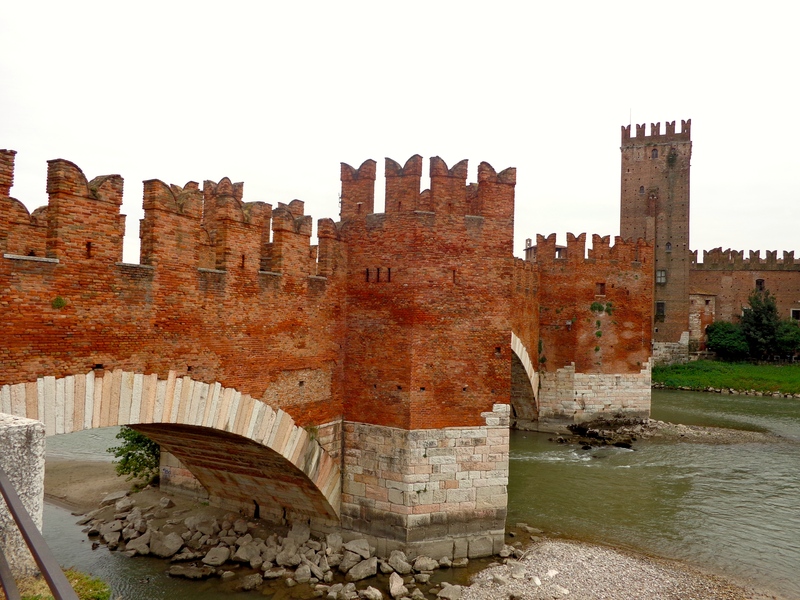 The Adige River in Verona passes gently beneath the red brick segmental arches of the Scaliger Bridge. Graceful in bearing, it was the world’s largest span at the time of its medieval construction. White marble lines the lower sections of the nearly 49 meter length, which connects to the powerful fortress of Castelvecchio. The day I visited the Castle was grey and chilly, making this imposing Gothic structure all the more real. As I crossed the bridge toward the castle, I passed striking M-shaped merlons (see in photo above) that ran along the top of the walls. The brickwork opened regularly to offer a view of the river and surrounding countryside. Peace and tranquility permeated the ambience of this visually romantic castle fortress. According to records, a tiny little church existed on this site prior to the castle’s construction. 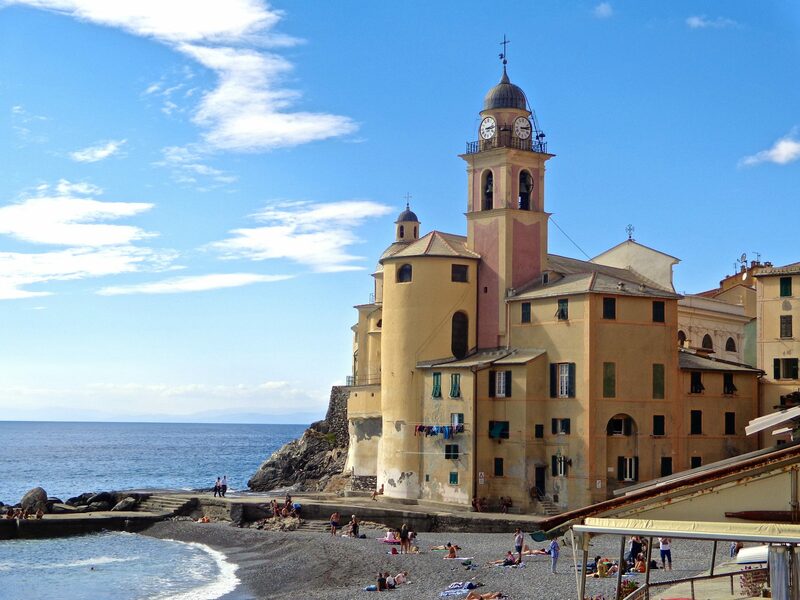 It’s name, San Martino in Acquaro, was adopted by the castle. It became known as Castello di San Martino in Acquaro. 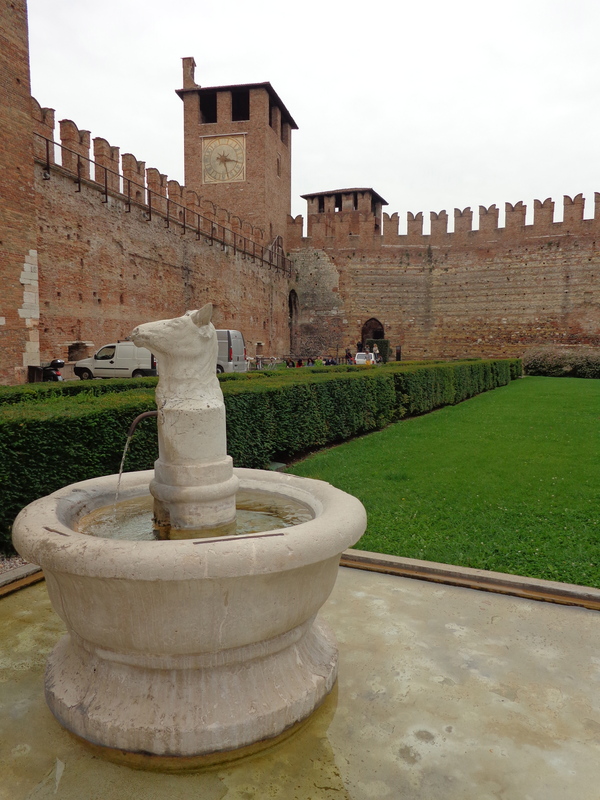 In 1404 it was renamed Castelvecchio, Old Castle, and became part of the Venetian Republic as their military compound. Seven towers in a pentagonal shape give a magnificent character to the castle, which is divided into four buildings. The super lofty castle keep has four main buildings inside. And, a castle is rarely without a moat that surrounds it. 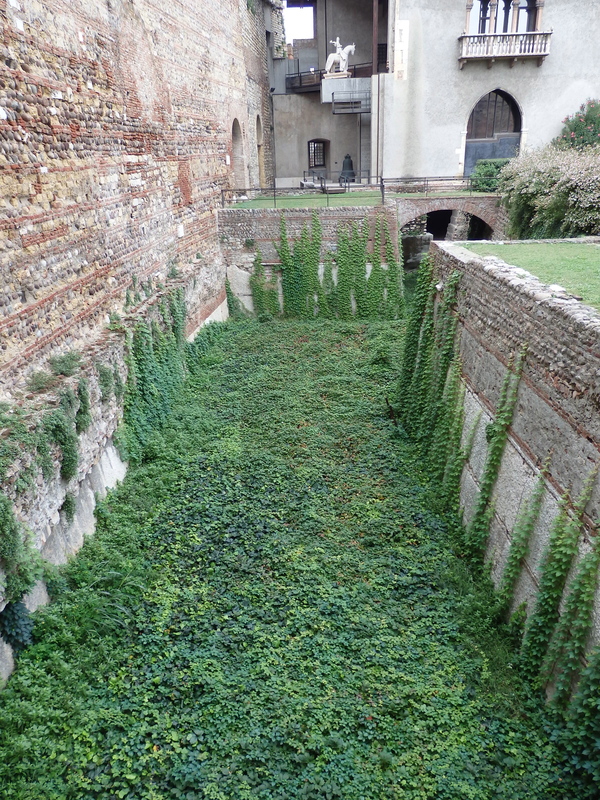 The castle moat is no longer flowing with water from the Adige River, but is full of lush greenery. Notice the equestrian statue of Cangrande I Della Scala at the top center. 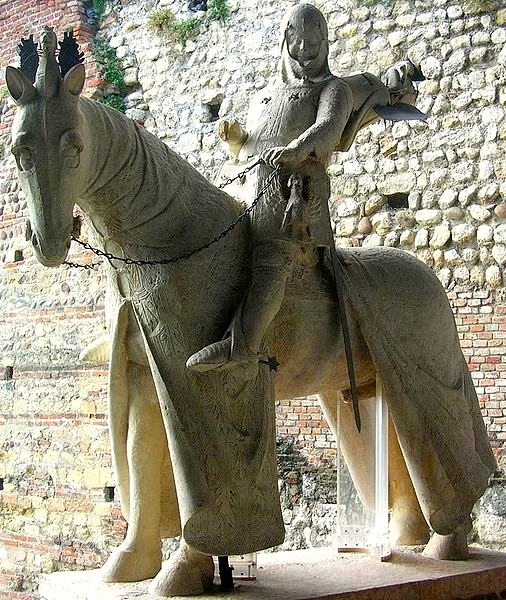 Equestrian Statue of Cangrande I della Scalla, sandstone sculpture from the early 14th century housed in the Castle museum. The castle remained steeped in historical events. It was brutalized by French troops during the Napoleonic Wars of 1796 when the population reacted violently to the anti-French revolt. 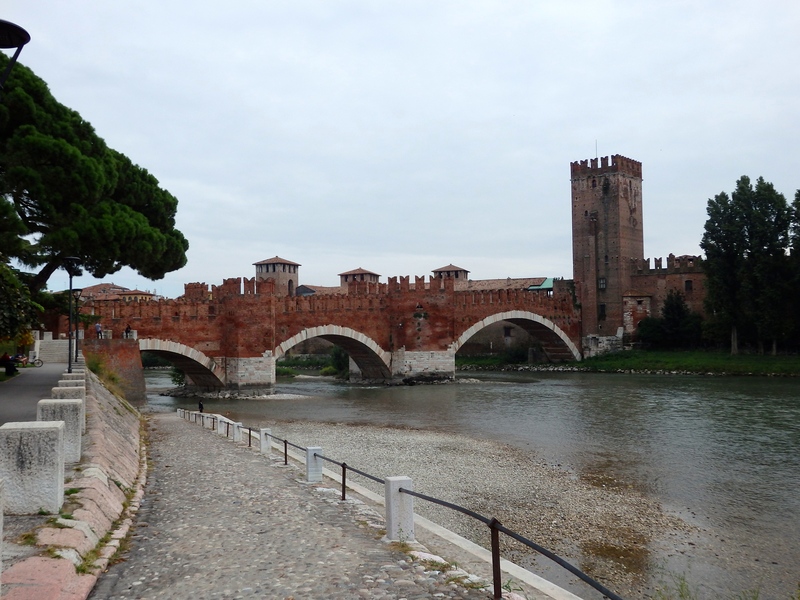 During WWII, the retreating Germans destroyed the bridge and tower (Ponte Pietra), which was rebuilt by dredging the river for the original mortar and bricks. Carlos Scarpa, famous architect of his time, implemented a final restoration of the castle in 1958. Born in Venice, he was an artist very sensitive to historical times. As a result, the Castelvecchio was carefully repaired to its original design. Evening sunlight plays delicately among the luscious grape clusters, casting shadows across the nurturing volcanic soil that feeds the vine. The sun’s vitamin-enriching warmth had done its job. Cool evening breezes softly lend rest for the night. 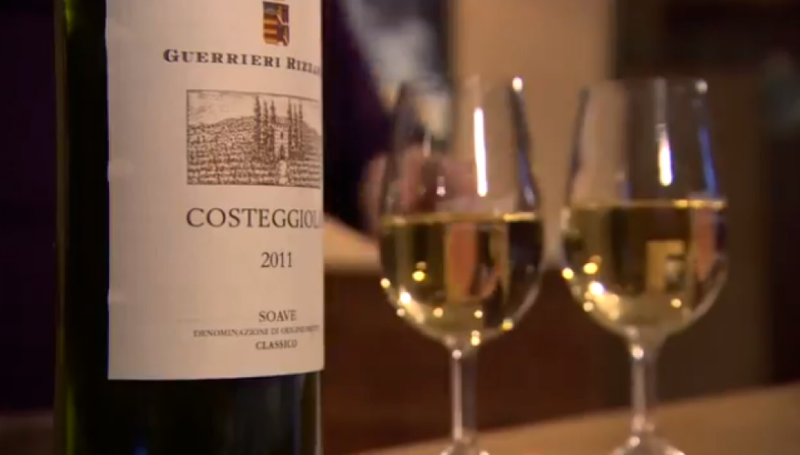 Italy today is a wine-lovers paradise. It’s not just the variety of grapes and tastes, but the wine embraces the ancient tradition of viticulture introduced by the Greeks thousands of years ago. 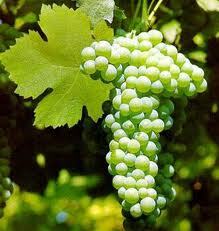 The Romans, eager to adopt their methods, continued to develop vine-growing into a wine that became world renown. Classico- wine that is grown in the original heart of the zone. Let me introduce you to the main wines that have stood the test of a very, very long time in the Roman Empire. Falernian, wine of the gods. Falernian, the greatest wine of all times favored by the emperors and popes… Known to mature with age and increase in value, it was grown just north of Naples near the ocean in the region of Campania. After the fall of the Roman empire in the 4th century, Falernian fell out of favor. Now known as Falerno, it experienced a revival 50 years ago in which the grapes that were used by the Romans were re-discovered through long research. 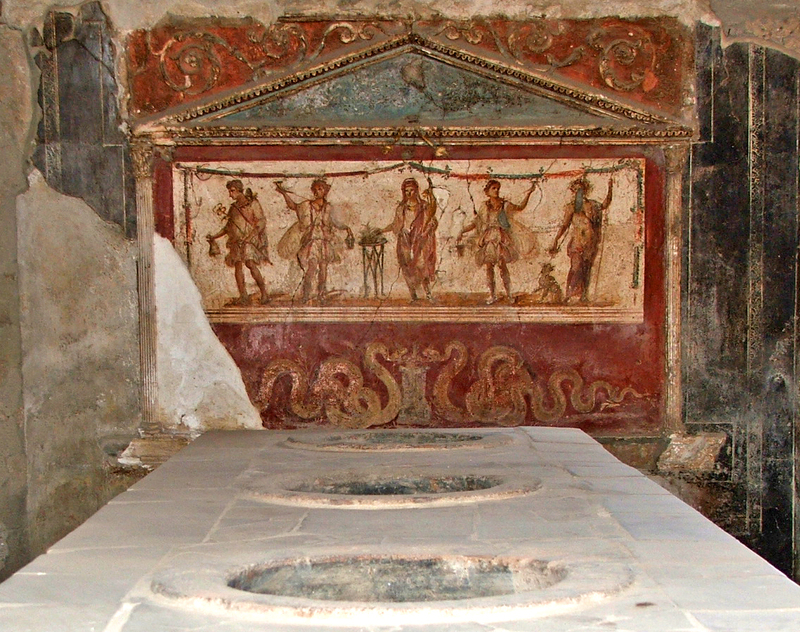 The red, they found, is the Aglianico vine, and the white is believed to be Greco di Tufo. 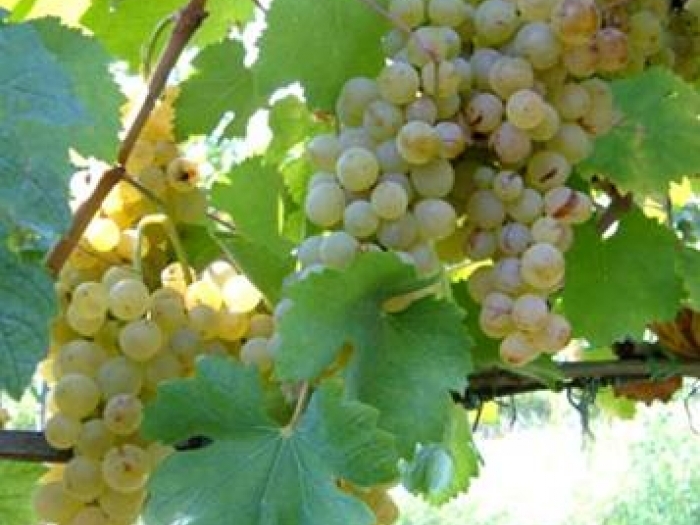 Greco di Tufo, historically a sweet wine, is the oldest white grape variety in Campania. Grown on volcanic soil, it is a clean refreshing wine that needs to be consumed young. Today it is vinified completely dry and paired with sea foods and salads. 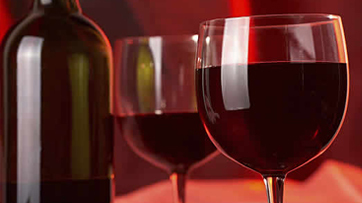 Valpolicella –Bright red and refined, with smooth fruity notes, this wine is grown in the Veneto, near Verona. Established in the 5th century BC. 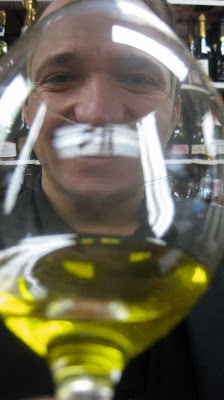 , it remains a light fragrant table wine. 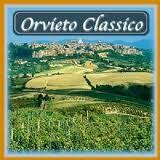 Orvietto is grown in the vineyards around the ancient hilltop town of Orvietto, in the Umbrian region. This wine is a straw-yellow color and delicately flavored. 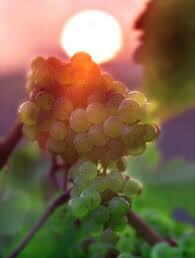 Established by the Etruscans in the 5th century BC, it was the favored wine of the papacy in medieval times! Ahhhh, Chianti! I love Chianti. 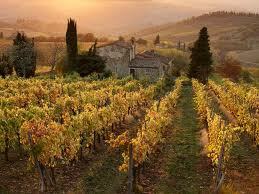 Originating with the Etruscans, it is grown in Tuscany between Florence and Siena. It is a glorious red wine with floral notes. The rooster seal on every bottle of Chianti Classico means that the company is a member of the Consorzio Vino Chianti Classico. 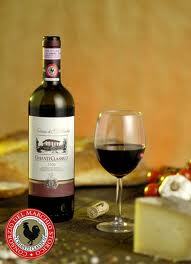 This enables them to protect, oversee and maintain the prices of the Chianti Classico. Verdiccio dei Castelli di Jesi is a medium bodied dry white wine. Because the grapes are green, the wine is straw-colored with green shades. It is flowery and harmonic. Verdiccio dei Castelli di Jesi is grown in the Marche region of central Italy by the Adriatic coastline. The best wines in antiquity were kept in amphorae or glass bottles. They were corked, but lead was used as an extra sealant. Clay, metal or glass cups were used to drink the wine. 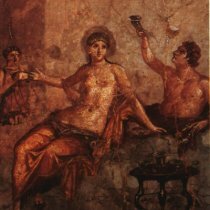 The Romans kept certain of their finest wines for a very long time. Horace wrote of drinking a vintage that was twice his age. However, most wines were drunk young. 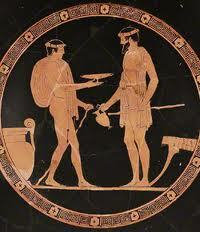 The Greeks and their wine, they preferred to drink out of shallow bowls. 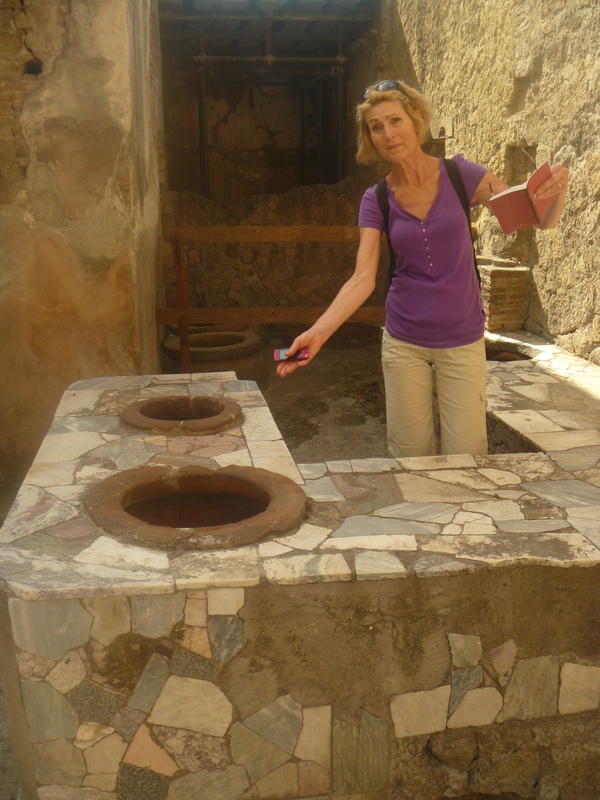 Ancient Bar in Pompeii-notice the celebration happening on the back wall. Pompeii’s Mt. 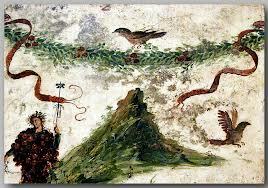 Vesuvius-bad for Pompeii but good for the soil! 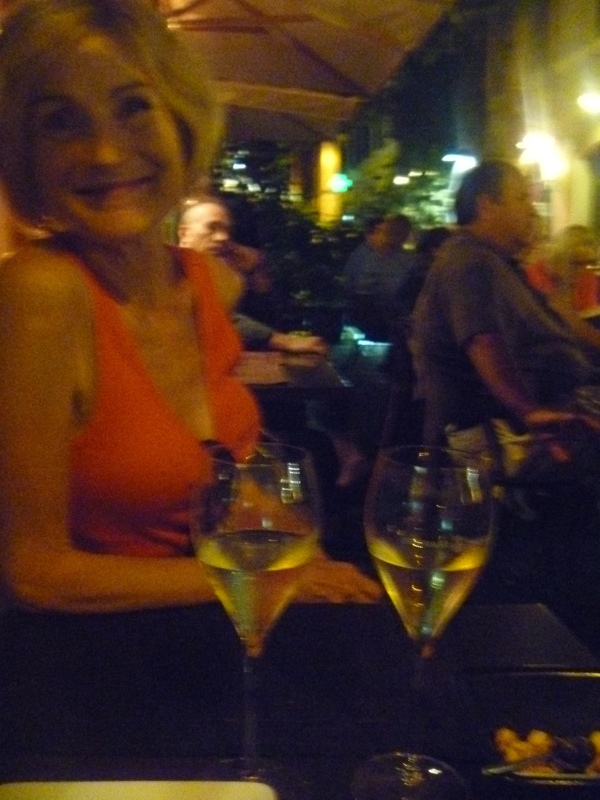 Today, each time I enjoy a glass of wine, whether I am in Italy or home, I can’t help but think of the Greeks and Romans. And so I toast to them for giving us one of their many gifts, the gift of wine! Join me for a glass of Falerno?